A long-term resident of Seoul, Michael Breen is a British journalist who first went to Korea as a freelance reporter, contributing to a range of international publications. His wife is Korean, and he speaks the language, although he engages the help of translators and interpreters when necessary. He has just published The New Koreans: The Business, History And People Of South Korea. The book began as an update to an earlier one, The Koreans: Who They Are, What They Want, Where Their Future Lies. This was written in the late 1990s, and Michael found so much had changed that his intended update turned into a new book. Who are the South Koreans, and where does their future lie? 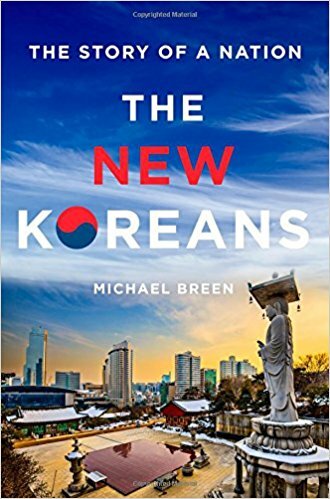 The New Koreans explores the nature and the values of the Korean people against the background of a detailed examination of the complex history of the Korean Peninsula, in particular its division, and South Korea’s emergence as an economic power. Given this is your second book on the subject, are you worried tracking the contemporary history of South Korea will come to dominate your writing life? I’m not done with Korea, but I’m done with this topic of the general study of it. A quick update to the new book would be manageable, but a major strategic shift on the part of the Koreans – like, say, re-unification – would need another whole new book and I’m not sure I’m up for that. Other than updating The Koreans, why did you write The New Koreans, and what did you hope to achieve with it? I wrote a book once about the North Korean leader Kim Jong-il but during the process I came to really dislike him. For some writers, this might get their juices flowing. But I was really unhappy with the result. I promised myself then I would never write about anything if I could not find a point of sympathy, preferably admiration. So, primarily, this is a work of critical affection. I could write about Korea because I love it and I am full of admiration for the Koreans. I wanted to highlight what I believe to be the international significance of the Korean story. Some people believe that the West and Japan developed at the expense of the rest, because of colonialism, and that attempts to get the rest to follow is a new form of colonialism. The Koreans have blown that one right out the water. They developed because they had the will and the right leadership. They did this with no resources and starting from the back of the queue. And they moved to the front in a generation and a half. That speaks volumes. It means that for leaders in countries that are not improving their people’s basic standard of living and rights, there are no longer any excuses. What is new about the new Koreans? What makes them so different from their forebears? The newness refers to their arrival as an advanced country. You can break this down into three parts. First came economic growth, then democracy, then the appearance of their culture, for want of a better word, on the international stage. Each of these parts, of course, keeps moving forward. The result is a people who look, think and act differently from previous generations. The better you know the old Koreans, the more astonishing this newness. For example, Korean men and women are the biggest per capita consumers of cosmetics in the world. They’re also among the savviest hi-tech users. And being weak on brand loyalty, they are willing to experiment. For these reasons, many companies now use them to test new products. On the newness downside, they have become among the unhappiest people in the world. When I arrived in Korea, everyone had five or six brothers and sisters. Now, fertility is almost at the bottom of the global charts and suicide is at the top, among OECD nations. The blurb describes South Korea as an “overlooked nation”. Why do you think South Korea is overlooked both within Asia, and also on the wider world stage? Like many Koreans and resident expatriates, I’m forever puzzled by this. By now, with South Korea, we should be long past the stage of books written by outsiders with titles like mine – The Koreans, The New Koreans – and into the more focused topics, such as education, healthcare and women’s rights, or the local effects of climate change. There are some more focused books, but for some reason they haven’t perked sufficient interest. One reason is North Korea. These days it seems that for every book about South Korea there are 20 about North Korea. I suggest in my book that South Korea concede and let Kim Jong-un have the word “Korea” – it’s only used in foreign languages anyway – and ask the world to use the proper name for their country which is Hankook. I gather you’re not tempted to try to write a sweeping account of North Koreans to complement your work on South Koreans? Right now, I’m really not interested in writing about North Korea, because there are a number of books out already that do a better job than I think I could do. But you reported on North Korea for Western newspapers, and you’ve been there, right? Yes. As a European, I was able to get to North Korea before the Americans were allowed in. From 1989 to 1995, I went seven times and, on one occasion, sat down with a group of reporters and academics with the founding leader, Kim ll-sung. But apart from the Pyongyang dateline and the colour, sounds and smells, you could report on North Korea from anywhere for all you’d learn on the spot. You might get to interview someone but the answers would be just like an editorial from the Workers’ Party newspaper. Apart from the distracting interest in North Korea, why else might South Korea be relatively little known in the West? I think another reason South Korea is overlooked is that it is surrounded by giants – China, Russia, Japan and, across the ocean, America. It isn’t small itself – it has 50 million people – but it appears somewhat dwarfed. Still, K-pop and k-drama are both popular within Asia, and Han Kang won the Man Booker International Prize last year. Do you like k-pop? K-drama? Can you list personal favourites in each genre? And do you think Han Kang’s success means South Korean literature is about to have similar success to k-drama? I do like 2NE1 and some older singers like Yim Jae-bum. But generally, K-Pop doesn’t do it for me. The stars are very talented, but they are manufactured as products in a strategic export industry. When I see them perform on TV, I feel like I’m looking at an ad. They get scouted young and put through rigorous training for years by large entertainment companies who then need to recoup their investment. What is missing is the singer-songwriter and the pub performance scene as a source of raw talent. On that front, the best thing to appear in recent years in my opinion was Busker Busker, which people overseas may not have heard of. As for dramas, I’ve seen a few being shot near where I used to live on the side of a mountain. But I’ve hardly ever watched them. I’ve seen some of the big movies. My recent favorite is Ode to my Father. Literature is different from pop music, dramas, and movies in that, while the latter exploded thanks to the wedding of talent and big business, literature marches at a different pace. To be noticed internationally, you need the writers, the translators and the promotion. I think translation and promotion are now happening and that we are with Korean literature where we were with Japanese literature a generation ago. What may happen is that the international market might fall in love with a handful of writers who may not actually be the most popular in their home market. Do you think people in The West know enough about South Korea to have misperceptions about it? If so, what do you think is the West’s most common misperception about South Korea? Many people overseas mix South Korea with North Korea. Besides that, I am not so aware of big misperceptions. For a long time, people thought Korea was like the American TV show M.A.S.H. but that old image has gone and it’s now known for hi-tech. People know now that Samsung, LG and Hyundai are Korean. They used to be taken for Japanese firms and, as their brands were better than the national brand, the companies did not go to any great lengths to correct this. I think the broader issue is lack of awareness rather than actual misperceptions. What was the most surprising thing you learned whilst writing your book? What do you think will most surprise readers, about the new Koreans? One thing I was reminded of writing the book was how, from the day I arrived 35 years ago, experts - expatriate and Korean - were pessimistic about the future and where the country was going. Another thing I thought I knew but found myself surprised by was freedom of religion. Western countries have freedom of religion, but the letter of the law is often clouded by prejudice due to history and the existence of an official state religion. In Britain, for example, there is religious freedom, but the preferred religion is very clearly indicated by the fact the Queen is the head of the Church of England. America has greater freedom of religion, but the God who is named in the Constitution was taken by the founders to be the God of Christianity. In Korea, though, there is real freedom of religion in that none are favoured. Even fervent Protestants, who believe the rest of us are going to hell, behave themselves. They’ll occasionally go into temples and try and cast Satan out, but the Buddhists are laid back about their attempts. It was telling for me that the recent scandal which unseated President Park Geun-hye began with allegations of manipulation by her best friend, the daughter of an alleged cult leader. The Koreans quickly lost interest in the cult part because it seemed irrelevant, but it took the international media much longer to let it go simply because of inbuilt religious prejudice. Sticking with that scandal, The New Koreans includes a time line concluding in 2016, with the influence-peddling furore around the Park administration. Would you change anything you wrote, now that she’s gone? It’s a pity such an important thing happened after my deadline. But it doesn’t really change the narrative. I had the same problem with the last book, when the Asian financial crisis nearly bankrupted the country after I’d submitted the manuscript but before the book came out. What about all the scaremongering about nuclear war, over the past few weeks? The New Koreans claims reunification is inevitable, even if the timing is unpredictable. Are you still so sure? The common wisdom in South Korea used to be that the Koreans were not re-unified because foreign countries didn’t want them to be. Now we know that it’s because they themselves don’t want to be. Right now, that’s because re-unification means “unification on my terms only.” On Kim Jong-un’s terms. Actually, the southerners right now don’t want that. I suspect we’ll get a regime change in the North and that the country will start to develop with a lot of help from the South and from the Chinese and Japanese. Eventually, they will unify. Don’t forget, Korea was unified for 1,300 years before its separation in 1948. I can’t see any politicians taking an anti-unification position once the North has developed to the point where merger is relatively painless. Despite political scandals in the South, and talk of war in the North, you said earlier you’re not planning on updating this book, so what are you working on now? Another non-fiction Korea-related theme. But it’s a secret. An elderly writer I met when I was at high school told me not to talk about plans. “Your creativity is like boiling water in a kettle,” he said. “Don’t let the steam out by talking about it. Let it come out in the writing.” I try to stick to that. Details: The New Koreans is published by Rider, in hardback, paperback and eBook, priced in local currencies.